ZEBULON, N.C. - The Carolina Mudcats are capping their promotions schedule for the fast approaching 2019 season with the addition of "Marvel Super Hero™ Night" and a "Captain America" and Mudcats themed souvenir bobblehead giveaway on Saturday, August 10 at Five County Stadium. 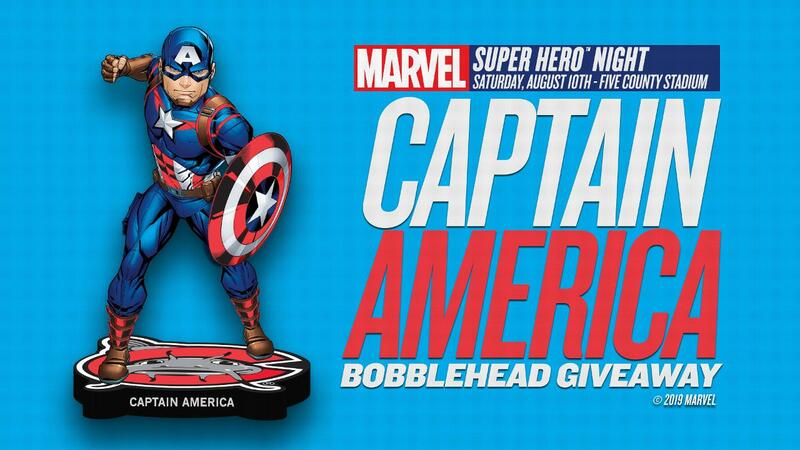 The Marvel Super Hero™ Night Captain America bobbleheads will be handed out to the first 1,000 fans through the Five County Stadium gates and in attendance when the Mudcats play the Salem Red Sox on Saturday, August 10 at 5:00 p.m. The bobbleheads will be available on a first come, first serve basis and while supplies last. Additionally, a limited number of the Captain America bobbleheads will be available to fans in advance with the Marvel Super Hero™ Night "Avoid the Line" Ticket Package. This package includes the Captain America bobblehead, a ticket to Marvel Super Hero™ Night on August 10 and a ticket to four select "Pick 5 Plan" games spread throughout the 2019 season for just $35.00. The Marvel Super Hero™ Night "Avoid the Line" Ticket Package is available for purchase online at www.carolinamudcats.com and by calling (919) 269-CATS (2287). Fans must be present at Five County Stadium on August 10 to receive the bobblehead. The list of available "Pick 5 Plan" games includes April 26-27, May 10-11, May 24, June 7-8, June 14-15, June 28-29, July 4-6, July 19-20, August 9-10 and August 23-24. With Marvel Super Hero™ Night added to the schedule, the Mudcats now have 13 souvenir giveaways scheduled throughout the upcoming 2019 season. The other giveaways include free magnet schedules handed out from April 11 through April 13, replica Carolina Micro Brews jerseys on April 13, Agricultural Night "Grown in Carolina" t-shirts on April 27, plastic beer steins on May 9, Copa de la Diversión souvenir bobbleheads presented by O'Reilly Auto Parts on May 24, Mudcats themed Hawaiian shirts on June 8, Jesus Aguilar souvenir bobbleheads on June 15, BBQ spatulas for Battle of the Sauce Night on June 29, 90s themed souvenir tank tops on July 20, bottle openers on August 1, ECU and Mudcats themed souvenir hats on August 15 and a Mudcats themed, replica F15 souvenir figurine for Military Appreciation Night on August 24. The 2019 season officially begins on Thursday, April 4 when the Mudcats travel to Grainger Stadium in Kinston to play the Down East Wood Ducks. Carolina's 2019 home schedule then begins with Opening Night 2019 on Thursday, April 11 versus the Wilmington Blue Rocks at Five County Stadium.